The AGM commences at 11.00 and followed by lunch at 13.00. There is a choice of 3-course lunch £20 or a 2-course lunch £15 per head for members and partners. Latest date for bookings Saturday 1st June 2019. To open the menu/booking form, click HERE. Something a bit different an evening cruise on the Kennet & Avon with musical entertainment by clarinet player, Pete Allen. The boat is the Kenavon Venture and she has a bar on board to supply the liquid refreshment to accompany the fish & chip supper that is included in the price of £17.50. The voyage lasts two hours from 7.00pm and starts and finishes at The Wharf, Devizes. A word of caution, the boat only holds 32 so early reservation of tickets will be essential to avoid disappointment. To book, contact John Craig 01380 726343. Please make cheque payable to John Craig. Lunch in the WILTON Room with choice of two or three course. This regular annual event has always been held in the evening. This year, as an experiment, this has been moved from an evening to an afternoon event. It will commence with a lunch. A 3-course festive lunch will be served at 1.00pm. The bar will be open from 12.00 noon. This is a change of venue as it will not now be at The Bear, Devizes as previously advertised. We are always looking for new events and venues and would be pleased to receive ideas from our members. The programme will from time to time include events that are run by other organisations to which we have been invited. Limited notice may be given for some of these and members are asked to regularly monitor this page. 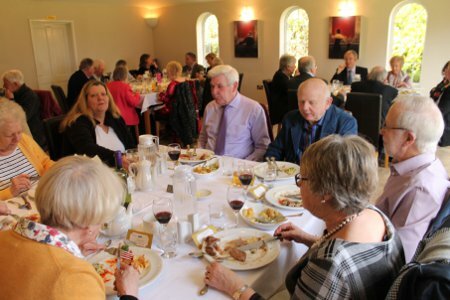 The WRFA Spring Lunch held on 6th April at the Shaw Country Hotel was much enjoyed by everyone attending. The dining took place in the Garden Room and the standard of cuisine and service was so good that those attending are urging repeat bookings at the hotel. 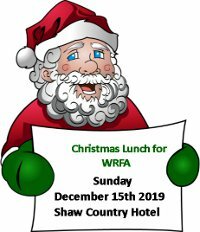 In fact, strong representations have been made to switch the WRFA Christmas Lunch from The Bear Hotel to The Shaw Country Hotel. This is being given serious consideration.